What Are Biometric Fingerprint Systems Offering Today And For Tomorrow? One big thing that today’s technology is trying to achieve is making us safer. With the advancement done in today’s technology we can see the systems being introduced that are making our lives and confidential information safer. Biometric systems without a doubt are the best advancement of the modern technology. It would be wrong to say that biometric technology was just invented since it has been around for quite some time, but the latest improvements have made this technology more widely available and easily usable. Biometric technology has become so common that now we can biometric doors locks for our homes. Of course, the technology is in its initial stages in terms of application so the price you pay for any devices that carry this technology will be higher. However, once you have a door lock that uses biometric fingerprint technology you are sure you have the safety for today and tomorrow. The question that might come in your mind is why we are going towards biometric technology in the first place. Are door locks not safe? Are passwords that we apply on our email, bank and computer accounts not safe already? Can’t we just live with the current system and technology? The answer lies in our temptation to achieve the best as humans. Of course, the password protected stuff is safe but not safer than biometrically safe stuff. Passwords can be hacked and forgotten but that’s not the case with biometric technology. If you have had your fingerprint scanned to unlock the door of your office or home, no one can open it unless you scan your finger on the system yourself. It is important to note here that biometric technology is not limited to scanning of fingerprints only instead it also includes the scanning of your eyes, voice, hands etc. The application of biometric technology can be seen commonly around us today. Just look at the modern smartphones that require you to put your thumb on their screens to unlock them. The past technologies such as number patterns, passwords etc. are nothing compared to this particular fingerprint sensing technology. This is biometric technology being used at individual and personal level. Businesses can make use of this technology in even better ways. 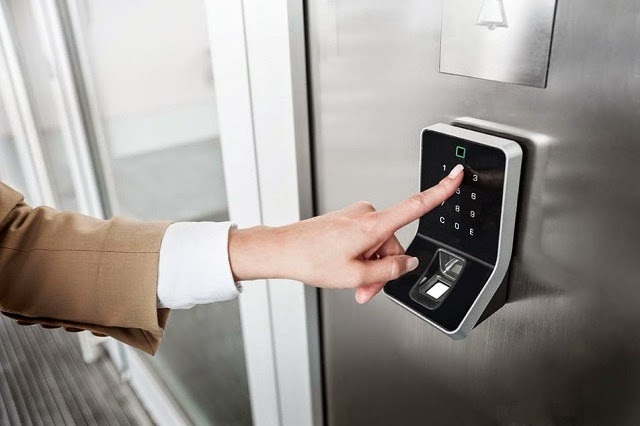 In fact, many companies around the world have been using the biometric fingerprint system to keep the login, logout, check in and check out times of their employees. With card swiping and manually marked “in” times the employees could always tell another person to mark their “in” time in the companies. They can’t do the same when they are required to scan their fingerprint on a scanner at the door of the office. In a similar fashion, biometric technology makes our security systems safer and error-free too. Not to mention, our home appliances will become safer with biometric technology too. For example, your children will never be able to accidentally switch on a blender, juicer or treadmill unless the machine in question scans your fingerprint. Some cool looking biometric door locks are definitely worth checking.